This entry was posted on August 23, 2017 by Jessica Anderson. Once upon a time, in 2000, Trophies2Go was one of the first trophy & awards companies to market on the web. It began as a child of Jeff’s imagination during the Dot.com boom, right as we were having our first baby. It was a crazy time, starting a business AND having a baby (I would not recommend). However in the long run, both grew and grew and now 17 years later, both are healthy and happy. 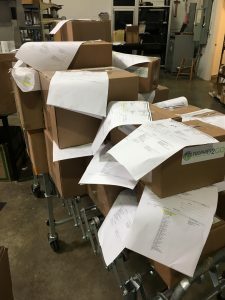 Trophy and award orders are packed and ready to ship to customers across the US. Two years ago, Jeff and I decided to again move with the times and launch our existing Trophies2Go website on a new platform called Magento. And unfortunately it was really really hard. The website looked fantastic, our products were outstanding, but we had a number of issues with customers placing orders, training staff on a new system, and bugs throughout the site. At the same time, Jeff, our leader, had started a new business and wasn’t around to right the ship. So I stepped in, Tom also became a partner and over the past two years, Tom and I have grown our sales and improved our site to the point where it’s one of the best in the awards industry. At the same time as all this online growth was happening, our retail presence was shrinking. Being in the Issaquah community since 1987 (30 years!!!) we had a number of loyal customers, but unfortunately, many of our long time customers had “graduated” out of buying trophy and awards for their teams, school, or companies. Whether their kids grew up and they were no longer coaching, they moved on to different jobs, they retired, or moved away, our repeat local customers were diminishing. All the while we had a beautiful showroom with lots of space, but not many customers to help pay the rent. And then there’s Amazon…they sell everything and have changed the ecommerce landscape with their large product offerings and quick 2-day Prime shipping on most items. Their products sell for cheap, are reviewed by other customers, and are delivered quickly, which is the new standard expected by savvy online shoppers. Looking toward the future, the Internet is where it’s at, there’s no doubt. With how much everyone lives on their phones, especially millennials, this is where growth will occur in retail. This past June we decided to bite the bullet and close our showroom to be an exclusively online award retailer. Bold move, but innovation is one of our company’s core values and we must be ahead of the times. We can still help our local customers with placing orders and they can pick up at our Renton warehouse, but we no longer have a large showroom with shelves of products for customers to touch and feel in person. Instead now everything is virtual! What I have learned through this process is it’s scary to put all of your eggs in one basket. I’m depending on my website and my development team to keep our virtual doors open and so far it’s worked well. I’ve also learned that it’s awesome to have great team who’s got your back during a big transition such as this. Everyone pitched in to help with our move and transition, with moving furniture and equipment, changing hours, installing shelves, and dealing with new phones and internet issues. I am truly grateful to work with such outstanding people. Also a special thank you to Gary Tinker from National Engravers, Inc for mentoring me through this process. This recent article in our Awards and Personalization trade magazine, ’The World is Changing – Are You?’ , sums up how important it is to remain relevant during these dynamic times. It’s hard to make a change, but I’m confident it will be the right decision for our company, our staff and our customers in the long run. Thank you Curt! I appreciate all of your support, Coach!